HK hammer set complete for the HK91, G3, PTR91, HK33, HK93, HK53, MP5, HK94. The hammer is one of the most abused parts on HK style weapons. Slamming into the steel bolt carrier with tremendous force creates a lot of stress. 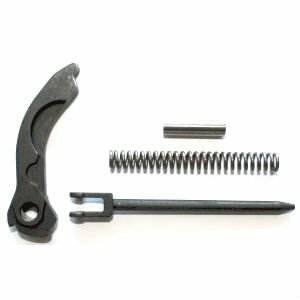 A fresh hammer spring can increase sure fire reliability. These are unmodified full auto hammers but can be easily converted to semi-auto by the home gunsmith. All other parts interchange in semi-auto or full-auto weapons.